Much going on, so I’m going to jump right into it. The area of disturbed weather in the Gulf of Mexico is starting to look a bit more organized. There is still about 30 knots of shear (stronger winds aloft in this case) affecting the tropical wave due to an upper-level low to the north-northwest. Satellite imagery above shows numerous thunderstorms over the central and eastern Gulf with some low-level rotation showing up south of Louisiana. This area will continue to drift west-northwest during the next 24 hours with some slow development possible. 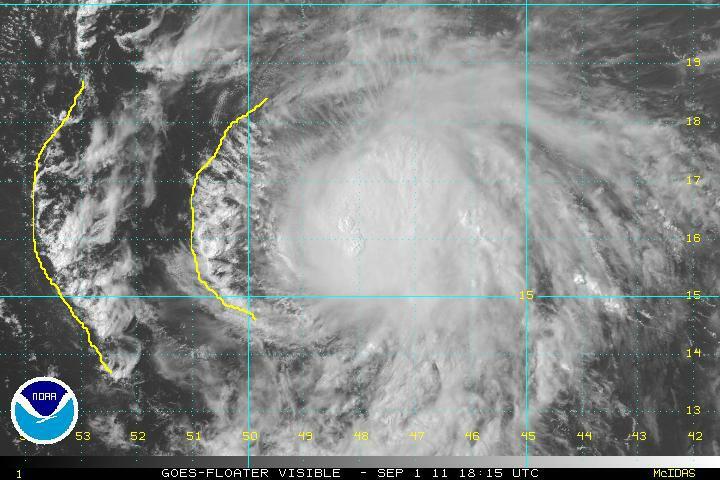 A hurricane hunter aircraft is scheduled to investigate the system this afternoon. The forecast for this system is tricky. 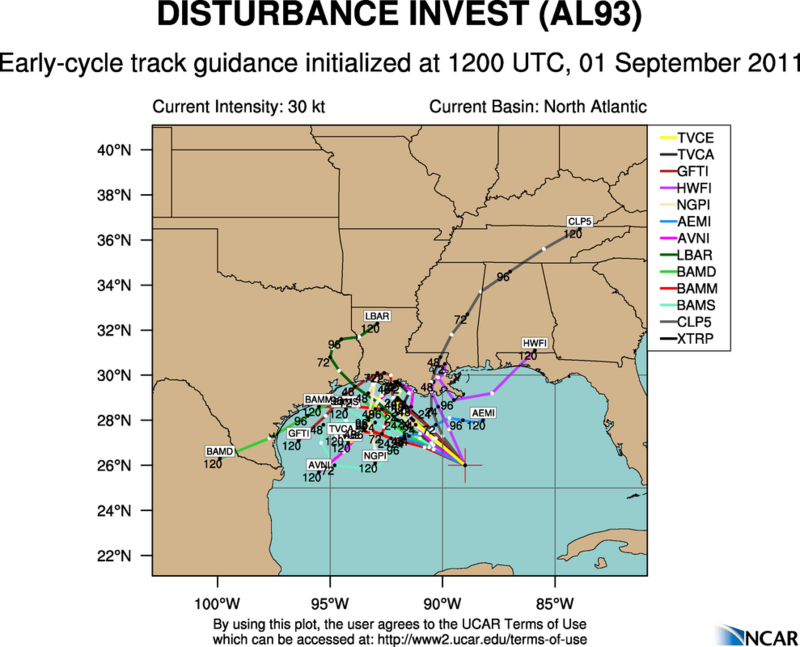 Model guidance agrees on taking the system to just off the LA/TX coast and then diverge significantly from there. The system may wander around that area of the Gulf until a trough exerts some influence in about 3-5 days. I personally feel this system will move west using the West Pacific as my guiding tool. A typhoon went west into China a few days ago and this seems to fit the teleconnection. Intensity is hingent on how close the system is to land. The airmass surrounding AL93 is very moist with little to no significant dry air nearby, so I think this has a chance to be a named tropical storm in about 24-36 hours if current trends continue. From there, it’s anybody’s guess. I see how it could become a hurricane as it is in an area of the world that promotes rapid intensification, similar to Hurricane Humberto (2007). 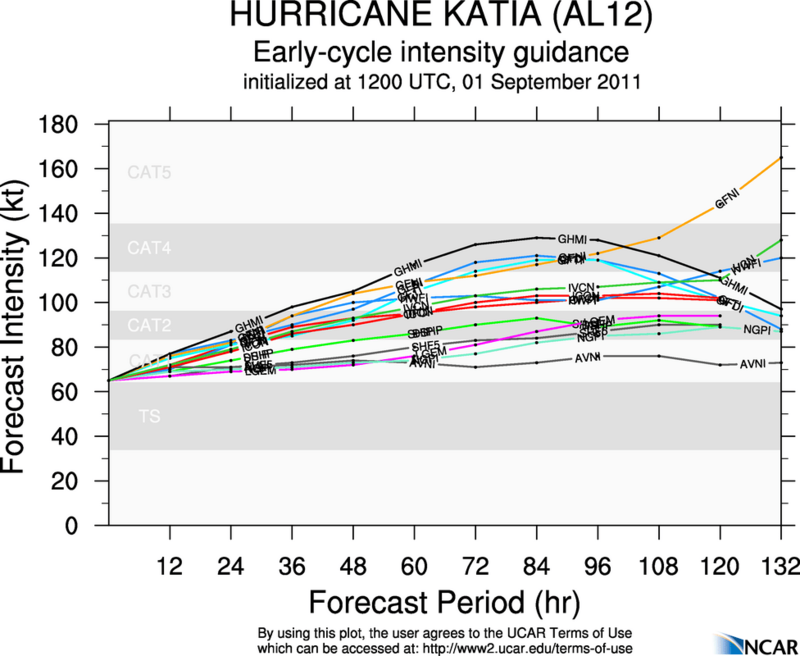 Katia is the 2nd hurricane of the 2011 Atlantic season and looks to be a pest right away. The image above shows a rather asymmetrical system with the majority of deep convection on the eastern side. This is due to some dry air courtesy of the SAL getting entrained into the storm. The yellow lines I drew on the image indicate the outflow boundaries that were caused by evaporation. The dry air interacts with the moist cumulus clouds and causes rapid cooling. This cool air descends rapidly to the surface, then fans out in the direction of the mean flow. This does not promote significant intensification in the next 24-48 hours. After this time, the storm should be able to mix out the dry air and the shear courtesy of an upper-level low to the northwest should abate. The track forecast for Katia is giving me stomach aches as I see how this storm could make it back to the U.S. in about a week or so. The overall pattern in the Northern Hemisphere dictates this to me, not any particular computer model. The large tropical storm (Talas) in the West Pacific has been moving west and is finally getting caught into the mean westerly flow around southern Japan. In about a week, I would expect a similar situation off the East Coast with Katia possibly threatening a track similar to Irene’s. I’m not trying to hype anything here, just saying that the possibility exists and the computer models will keep shifting all over. The guidance above shows a west-northwest motion with some members bending the track back west at the end of the period. The Euro, UKMET, and NOGAPS models are all indicating a further west track today, while the GFS and CMC models threaten Bermuda. This is still a long way off and we have time to get a better handle on this pattern. 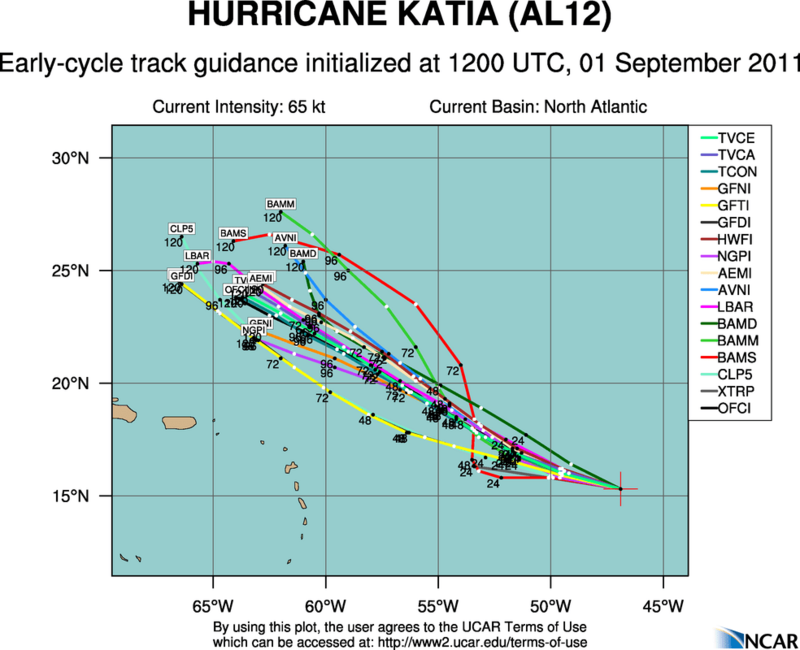 My forecast though is to keep Katia moving west and possibly becoming a threat by mid-week next week. 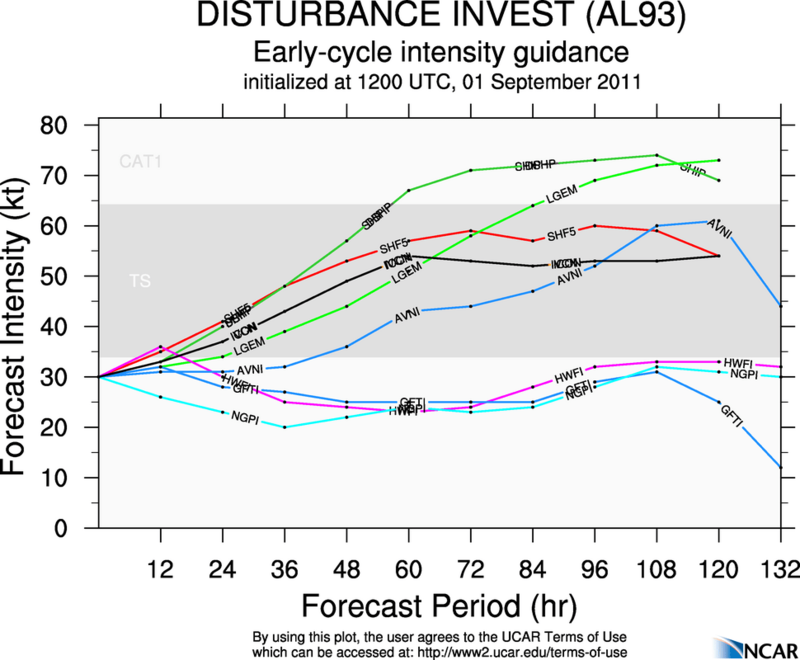 Intensity is tricky for the first 24-48 hours with the influence of dry air and modest shear, but most models to indicate a period of strengthening is on the way. The most extreme of the models (GFNI) brings the intensity to 163 knots or 188 mph in 120 hours. I highly doubt this will be the case, but we could be looking at a Category 3 or 4 hurricane roaming the Atlantic in about 4 days, if not less. The stronger the hurricane, the more ridging to the north and the further west it may move. Food for thought. Alex, thanks for the compliment. Feel free to ask questions at any time. As you know, this side of meteorology is my passion.